If you’re a consistent traveler and searching for cars to use in different places that you want to go to, IzziRent Car Rental App for iPhone is one great app to consider. This app offers a wide selection of cars that you can book in selected destinations like Germany, United Kingdom, France, Italy, Croatia, Spain, UAE, etc. The app also features top-notch car hire companies worldwide in the likes of Europcar, Enterprise, Sixt, Dollar and may more. The app interface is easy to use; in fact, you can book a car in three easy steps. The main interface will take you to major tabs like Booking, Account, Info and Support. There’s also a Share tab that lets you publish posts in your social media accounts. Booking tab includes pick up and drop off country options together with other essentials like date, time, age and currency. Navigating each tab is such a walk in the park; an offer page will also prompt you with discounts and promos together with lists of locations and cars. The app also offers helpful directions like Car Rental Guide and steps on how to successfully book your car. This way, it would be a lot easier for new users to find the most comfortable cars in town. Plus, you can also share your transactions in Facebook, Twitter, Email and SMS. IzziRent also gives you the option on your preferred currency transactions. You can select from Euro, USD or GBP. This app is plain simple and minimalistic. The straight-forward nature of the app is one of its selling points. 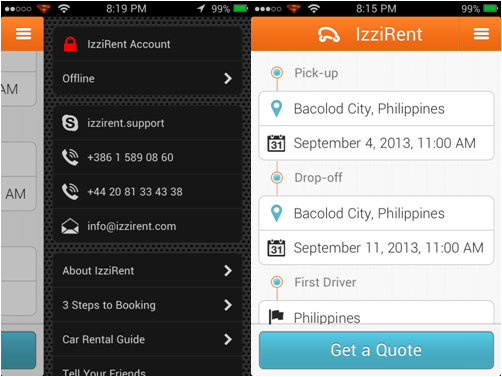 Likewise, the IzziRent for iPhone is one of the best ways to deal with your car rental deals. It is safe and easy to use. Check it out on AppStore and see how customers like the way they use the app.